Our political visitors to the training centre this week were local election candidate John Walsh who was accompanied by Brian Walsh TD. The two brothers were greeted by Carol and coach Sam, before receiving a full tour of the training centre. They also had a chance to meet with head coach Sally who had just returned from the European Gymnastics Championships. Over the past 8 weeks of campaigning I’ve met a lot of people talking about Renmore Gymnastics, and I kept imagining a small club meeting weekly in the community centre. But this is something different altogether. This is really something special. As someone who is very involved with local sports clubs, I am genuinely impressed with what’s happening here, from both the participation and sports excellence perspective. 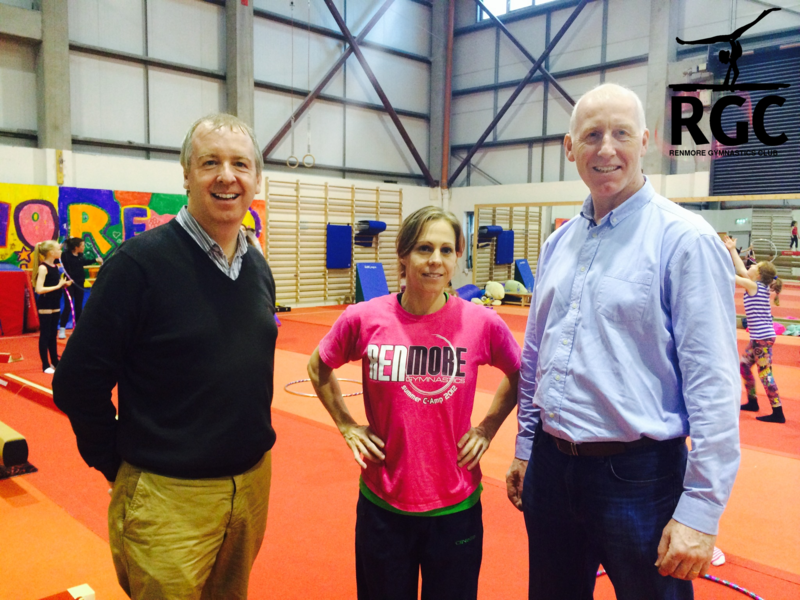 This is a real asset for Galway City and County, and if I am elected on May 23rd, I will put Renmore Gymnastics Club front and centre with the community groups that I promote. Whatever happens, I must commend the coaches, staff, and volunteers on what you are doing for the children and for the Galway community. You’ve obviously done a remarkable job until now. Keep up the good work! John and Brian, thank you for coming to see what we’re doing! We are working hard to make gymnastics an integral part of sports in Galway, and to raise the standard of Irelands’ gymnasts so that we can take a meaningful place on the world stage. Previous postRGC Recreational Summer Camps 2014 Online Registration Open!